Joseph "Joe" Satriani (born July 15, 1956) is an American instrumental rock guitarist, multi-instrumentalist and multiple Grammy Award nominee. Early in his career, Satriani worked as a guitar instructor; many of his former students have achieved fame, such as Steve Vai, Larry LaLonde, Rick Hunolt, Kirk Hammett, Andy Timmons, Charlie Hunter, Kevin Cadogan and Alex Skolnick. In 1988, Satriani was recruited by Mick Jagger as lead guitarist for his first solo tour.In 1994, Satriani was the lead guitarist for Deep Purple.He has worked with a range of guitarists during the G3 tour, which he founded in 1995. His G3 collaborators have included Vai, LaLonde, Timmons, John Petrucci, Eric Johnson, Yngwie Malmsteen, Brian May, Patrick Rondat, Paul Gilbert, Adrian Legg, Steve Morse and Robert Fripp.He is currently the lead guitarist for the supergroup Chickenfoot. 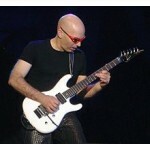 Since 1988, Satriani has been using his own signature guitar, the Ibanez JS Series, which is sold in music stores worldwide.